Decorating a home takes a lot of time, effort and dedication. There are many different elements and pieces that can complete the look of a home and add something extra to the space. Whether you are decorating with furniture, art or colorful pillows and chairs interior design is a big commitment and financial investment. A unique way to add to the interior design of your home without spending an unreasonable amount of money is using plants and flowers. Decorating with plants allows you to nurture your inner creativity while adding unique and inspired elements to every room and space in your home or office. The benefits of interior design with plants are also an added bonus. Plants can help clean and filter the air in your space, reduce stress, boost mood and productivity as well as reduce major health concerns. Now more than ever, the art of gardening and interior decorating with plants is being adapted for spaces of all styles and sizes. From life size terrariums to the smallest of potted plants, the indoor gardening options range in size and complexity, while maintaining style and unique design. Whether you are creating a small arrangement for your dining room table or you want a full-blown mini jungle in your home, we can give you many tips for creating an amazing interior garden. When decorating with plants, every aspect of the process counts – anything from the plant container to little decorative elements in and around the plant can make the biggest difference and complete the look of your space. Here are a couple of tips for creating an amazing interior garden from our experts at Interior Gardens to get you started. What you plant in your interior garden is a personal choice and it depends on the effect you are looking for. You can plant anything from flowers, fruit trees, herbs and spices and more. The plants you choose for your interior garden will lead the way throughout the rest of the decorating process. If you choose to plant succulents and other cactus type plants, then you are setting your interior garden up for a desert type design. You can accentuate this style with sand and decorative rocks to mimic the natural environment for these plants. If you are planting all green plants, you can combine them to create a pretty and eye-catching design. If you decide to plant colorful flowers such as fragrant orchids, then you can group a couple different types together to create a beautiful and sweet-smelling arrangement. Believe it or not, the container you plant your interior garden in is a big part of the design aspect. Regular planters are generic and they are perfect for big arrangements that are already very eye-catching, but if you want to get more creative with your interior garden you can plant in almost anything. You can plant small plants in old metal tin containers from tea or coffee for a vintage effect. Line up a couple of these tin containers against a windowsill or group them together for a beautiful effect. You can also plant in bottles, glass bowls, treasure chests, benches and fabric planters and even on the wall! 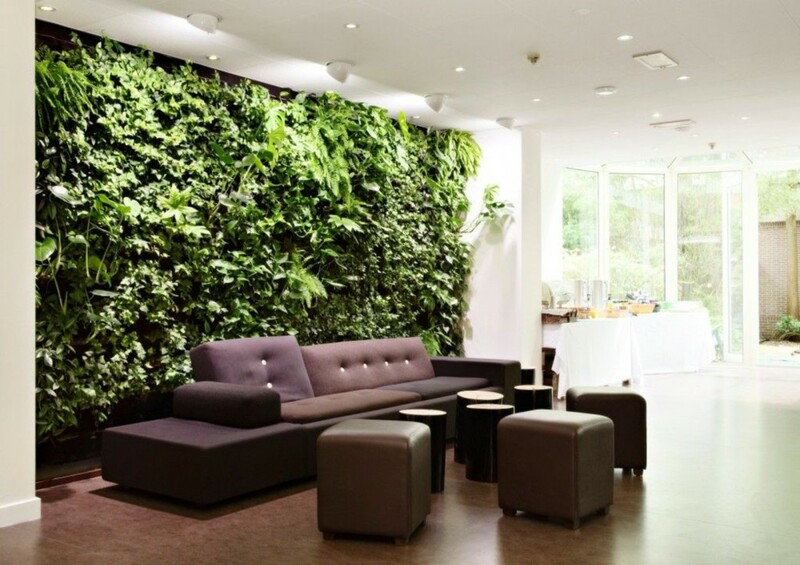 A vertical wall arrangement is like painting your wall with living, breathing and beautiful plants. It really does not matter where you put your interior garden as long as there is sufficient light and the needs of the plants are met. There are however certain arrangements that look better and complement specific locations better than others. An herb garden, for example, belongs in the kitchen. Flower arrangements look good in the dining or living room, and certain plants like the snake plantare perfect for the bedroom. Ferns, succulents and standing trees will adapt to any corner, space or nook in your home or office. Although your plants standing alone are enough of a decoration and design element, you can always spruce up the arrangement with extra pieces. Adding in decorative stones such as marbles in a glass bowl arrangement will add a classy and elegant feel to the design. If you are decorating with tall standing trees, you can add in blinking lights to make them stand out at night and to create a romantic atmosphere. There are also clip ins that range in style and size such as butterflies that can add a fun touch to all of your interior garden plants. The most important tip for creating an amazing interior garden is to keep it healthy. Your garden will not be amazing if your plants begin to get sick, rot or die. Make sure to buy proper fertilizer, to water your plants efficiently and to ensure that they receive the proper amount of sunlight. There is nothing better than a thriving and healthy interior garden, and nothing worse than a sad plant cemetery that is neglected. Make sure to love your plants as well, although they are just plants statistics prove that plants flourish with positivity and in happy environments. Although you may be decorating with plants for pure design reasons make sure to also take the time to enjoy your arrangements. Interior gardens add to the aesthetics of your home or office space, but they should also bring you joy through their beauty. If you have any questions about choosing plants for your interior garden, about arrangement techniques or about plant care, don’t hesitate to contact our experts at Interior Gardens. We can help you pick the perfect plants, assist you with the installation and provide you with personalized care instructions. We will also check in with you periodically to make sure your interior garden is healthy and thriving and that you are enjoying your arrangement. Contact us today, we look forward to hearing from you!